A descriptive account of the families, genera, and species indigenous to Great Britain and Ireland, with notes as to habits, localities, habitats - Edward Saunders. Published in 1896, this book is of considerable historical interest. The downloadable pdf of this rare book still contains much of interest, as well as a splendid series of hand-coloured plates depicting many species of ants, bees and wasps. 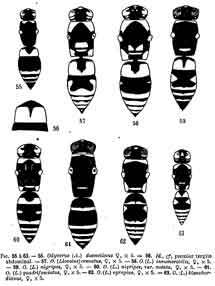 Saunders' work contains the last published comprehensive account of the British Bees (Apidae). This was the classic work on British aculeates for many years. It contains many fine hand-coloured plates, which may be helpful to those who are not yet familiar with the British aculeate fauna. In addition, the comprehensive species descriptions are extremely helpful for determining aculeate specimens. You will need to check names against the checklist in the BWARS Members Handbook, or other recent checklist. pdfs of three excellent (although somewhat outdated) volumes are available from the Fédération Française des Sociétés de Sciences Naturelles web site. These works contain many illustrations, so should prove useful to most aculeate workers, even those who do not read French.